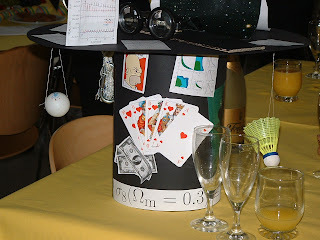 Before your defense, your friends get together and make you a hat and decorate it with stuff about you (e.g., poker or weak lensing). Then, when all is said and done and the congratulating begins, they put a ratty old academic robe on you and put your hat on your head. There's a cart (really a dolly with a chair on top, decorated with colored paper and balloons) and you sit in the cart and they push you all around the building, as everyone follows behind making noise (mostly jangling their keys). That's right. You get your own parade. Now it's too late for me, but not for all of you: go demand your own parade, now, while you still have chance. Anyway, I would have taken more pictures to illustrate the awesomeness of the whole thing, but I felt a little ashamed to be using someone's celebration for anthropological purposes; I'll try to get more at the next defense.